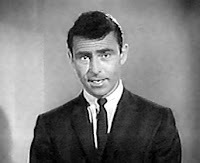 Submitted for your approval-- in The Twilight TONE." I have been around Mesquite almost all of my life and have grown to appreciate its beauty. Ranchers around here can't bulldoze and burn it fast enough because it is very invasive and it takes over valuable grazing land. 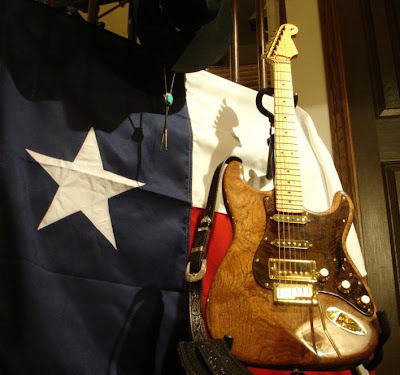 It was while living in Corpus Christi in 1991; the first thought about owning a mesquite Stratocaster entered my mind. That thought generated more than a few laughs back then. 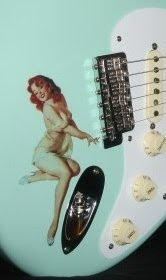 B. Hefner refused to produce a Stratocaster body from mesquite as well. After continuing my search on Mesquite using Google, I finally found a mention of a mesquite Stratocaster. 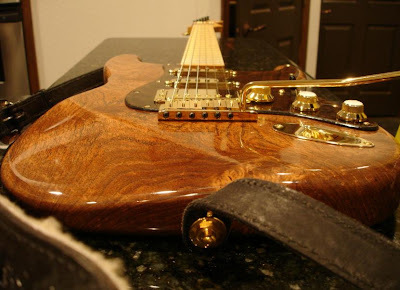 JP (Stratoblogster) had posted the question in 2007, wondering if anyone had created a Stratocaster out of Mesquite. I'm certainly not claiming to be the first here and I know of at least one other mesquite Strat that was posted the same day this project was announced (January 30th, 2009). My mesquite project began in February of 2008. Besides being very dense, it is beautiful, extremely stable and warp resistant… Why not? 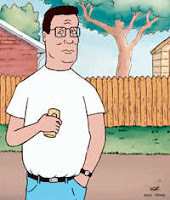 I’ve always said if it doesn’t work out, I’m throwing it in the fire and we’re having steaks! The body is modeled after a late 1950's Stratocaster Body with the exception of a contoured neck heal upgrade that I've included. The pickup routes were routed with extra room to eliminate the pickups and controls fitting tight. The control and pickup cavities are painted with conductive paint for shielding. The body was sprayed with vinyl sealer and a vintage thin skin nitrocellulose lacquer finish as Gibson and Fender both used in the 1950's. The Body Weight is exactly 6 lbs with the tremolo inserts installed. The neck is a Warmoth pro construction Stratocaster neck and as mentioned before they do excellent work. Being a huge fan of Van Halen, I chose a birdseye maple neck with a Wolfgang asymmetric back contour and a vintage truss rod. The vintage truss rod was my choice in an attempt to capture a vintage tone. That being said, the neck does have a Gotoh side adjuster to ease the burden of adjusting the truss rod. There are 22 frets at a scale length of 25 1/2" with an 1-11/16" nut size and a compound radius of 10" to 16". According to Warmoth, a 16" radius at the heel has proven to afford 2-1/2 step bends with action below a 16th of an inch! In usage, the changing radius is not really noticed. It is simply easier to play on and more comfortable. 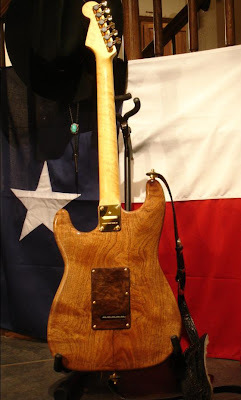 I've trimmed the guitar in gold and picked Texas Specials in tribute to Stevie Ray Vaughan. The bridge position Seymour Duncan Antiquity humbucker is a faithful replica of the great sounding "patent applied for" humbuckers that Seth E. Lover designed in 1955. The pickup comes with slight variations in DC resistance, just like the old ones. The bridge pickup is wired a little hotter and better balanced for its position. The pickup is not wax potted, to retain the sound and appearance of the originals. I tried to put convenience into the equation as well from my own experience over the years. The Planet Waves tuners are locking and self trimming. The tremolo system is a gold 2 point deluxe tremolo with the snap in arm and an LSR roller nut installed at the neck. For that Texas accent, there is a sterling silver pendant with a gold star embedded in the headstock that was designed originally for our State Capitol in Austin. The gold neck plate is custom and was chosen to honor the battle of Gonzales; where the first shot was fired in the Texas revolution. The "come and take it" flag was flown in Gonzales on October 2, in 1835. As mentioned earlier in this thread, the mesquite wood is from Kingsville, Texas. The main guitars that I use today are a stock 89 Fender Stratocaster (my first real guitar) and a tiger maple topped Custom Les Paul ’68 Reissue. After plugging the mesquite Stratocaster into my Marshall stack, I wasn’t sure what to think of the sound… The mesquite Stratocaster didn’t sound like my Fender Stratocaster or a Les Paul. The guitar has great sustain and clarity and it is somewhat bright as you may have expected. I can feel the body chime with tone while playing. The Antiquity pickup is hot and harmonics are easy to achieve but with a clean Jazz type preset, the guitar has an incredible clean and pleasing voice. I’m very pleased with the difference in tone and realize that I’ll need to create some presets to compliment this particular instrument. I’ve ordered a custom tremolo brass block and a Callaham steel block for additional tone testing. Swapping out the Antiquity with a few other choice hum buckers to tone test are in the plans as well. Once I get a little experience with the guitar, I’ll record the samples as promised and pass them to JP for posting. Eventually the neck will be replaced with a native wood neck consisting of at least three species. I'm currently searching for Texas ebony for the fret board and checking on big tooth maple for the neck wood. My name is Frank Willenburg and I hope you like the guitar; it will not be my last.